Register NOW! Only 80 youth will be accepted to camp this year! Please fill out our online registration form below. You will have to fill out the information for each child (thus you may have to enter the information multiple times). DEADLINE: July 29 2018! Please note, do not delay. Last year we reached capacity very quickly and had to close registration and some youth could not attend. READ the registration form before you sign it. ​If you wish to send a cheque or pay by cash please email us to make arrangements to mail it or pick it up. Campers ages 9-16: $395. Max 40 girls and 40 boys. Leaders-In-Training youth ages 17-19: $295. Max 10 boy & 10 girls. We accept cash, cheques, e-money transfer, credit cards, & Paypal. PayPal charges close to $13 per camper, that is the reason for the difference in fee vs the PayPal form. If you wish to avoid the additional fee please mail a cheque or deliver it or cash to 375 Somerset st West. Ottawa, ON K2P 0K1. If you wish to make an email money transfer please contact us at myoadmin@gmail.com Fees may apply. Full week overnight accommodation, full meals, and snack, equipment and prizes all included. Paypal fees are non-refundable. MYO endeavors to fund-raise to provide some subsidies. This is not guaranteed. Please contact us as soon as possible for more information about that. Last year, thanks to our donors, we were able to finance the camp adequately. Donate Now! 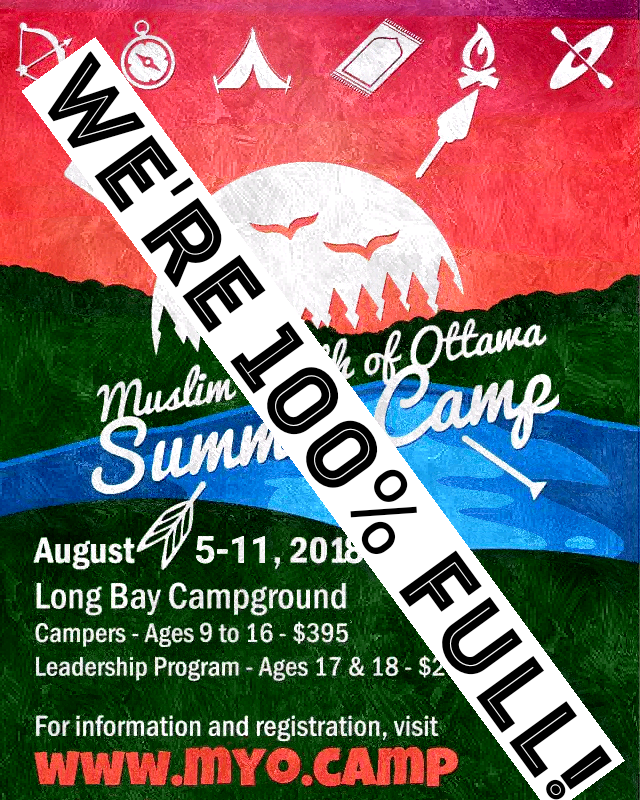 This year we are planning to sponsor Syrian refugee children and youth to attend our summer camp and experience the wonderful Canadian tradition of camping and to enjoy our beautiful outdoors.